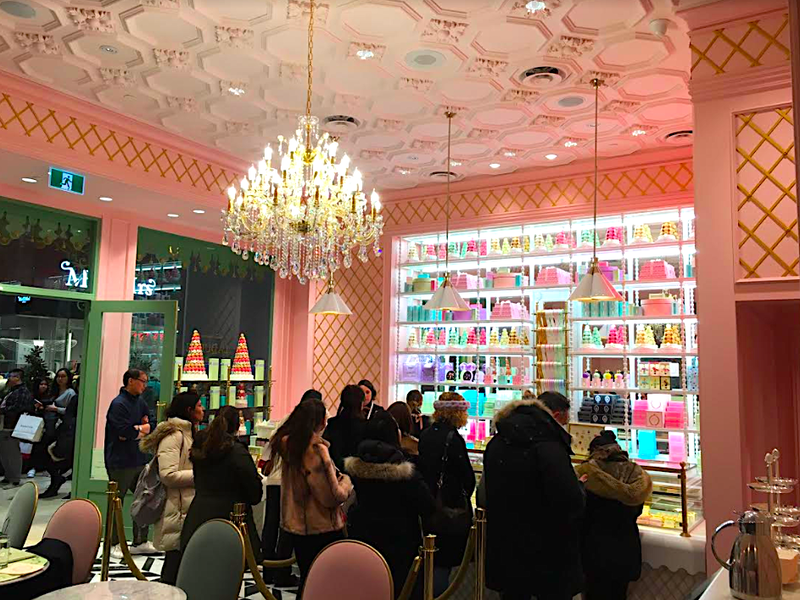 French luxury bakery and sweets maker Ladurée opened its first Toronto location at Toronto’s Yorkdale Shopping Centre on Thursday at noon and as was expected, there were lineups to get in. Yorkdale marks Ladurée’s third Canadian location, following the opening of its first two in Vancouver. The 1,185 square foot Yorkdale Ladurée is in the mall’s ‘luxury wing’, across the hall from Saint Laurent, and next to Links of London as per the mall floor plan below. Ladurée features a retail area as well as a 26-seat tea salon. The menu includes Ladurée’s signature macarons in a variety of flavours, as well as chocolates, specialty teas, jams, branded honey, Ladurée accessories (including candles, room fragrances) and other merchandise such as key chains and shopping bags, as well as gift boxes. The tea salon features a variety of tea and other drinks, as well as popular menu items such as French toast, salads, sandwiches and Afternoon Tea. For a limited time only, Ladurée is offering a Maple Syrup-flavoured macaron at its Canadian locations. The interior design was inspired by the colonial style of the 18th century — the pastel pink tea room is decorated with a white marble sales counter that is beautifully accentuated with gold lattice details. Gold Lattice is also present on the walls of the salon, providing a cohesive and luxurious backdrop. A Classic crystal chandelier contrasts with contemporary madeleine lights hanging from the ceilings, as well as the geometric marble tile flooring and velvet-accented furniture. The store’s soaring ceilings are dramatic with plaster ceiling treatments — it’s the first Ladurée store to feature the brand’s updated look. Overall, it’s a beautiful setting that brings a bit of Paris to bustling Toronto. The Yorkdale Ladurée was built by Vergo Construction’s Commercial Interiors Division, which provided complete construction management including the planning (drawings, etc), procurement and project management of the entire project. Ladurée worked directly with landlord Oxford Properties on the Yorkdale deal. “We had a shared vision,” said Olesya Krakhmalyova, Canadian licensee for Ladurée. She said that Oxford presented a retail space opportunity that was just too good to pass up. Ladurée entered Canada in March of 2016, when it opened a 1,100 square foot boutique and 23-seat tea salon at 1141 Robson Street in Vancouver. 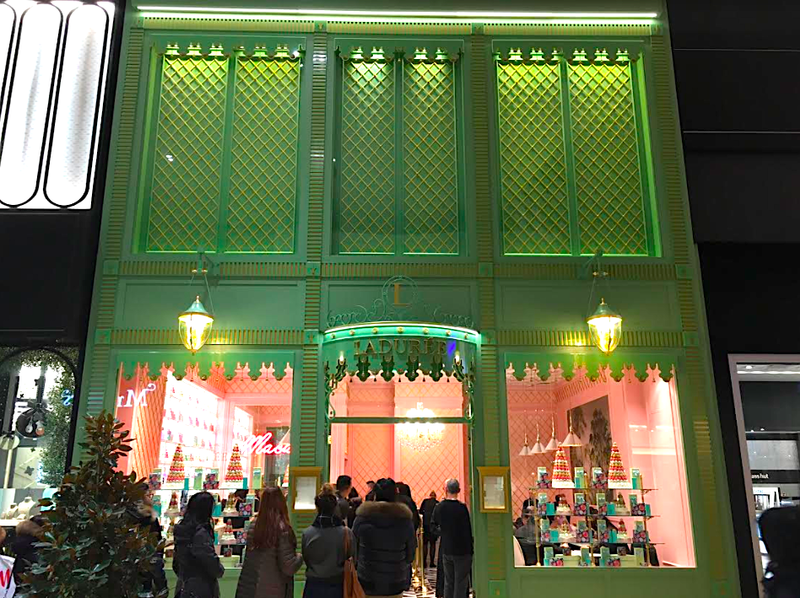 That was followed by a second Vancouver location in March of 2017 with the opening of a 500 square foot Ladurée concession (including an 18-seat tea salon) at Vancouver’s Holt Renfrew flagship, adjacent to the store’s recently overhauled 8,500 square foot women's designer footwear salon. Ms. Krakhmalyova said that she expects the new Yorkdale location will be able to serve alcoholic drinks in the spring of 2018. Ladurée ice cream is also expected around that time, as well. Ms. Krakhmalyova explained how each Ladurée location requires detail-oriented precision and because of this, the Canadian rollout will be carefully executed. 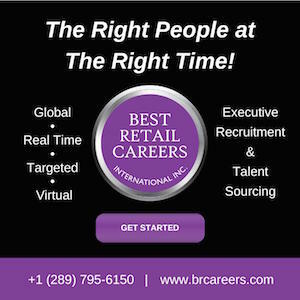 The two Vancouver locations opened almost exactly a year apart, she noted, and the company’s focus for Toronto will initially just be on the Yorkdale location. The Vancouver locations will see an expanded assortment of fresh pastries next year — Ms. Krakhmalyova explained that she will be opening a ‘pastry laboratory’ kitchen in the city in the spring of 2018, and that a pastry chef is being moved to Vancouver to supply locations with a full range of Ladurée pastries — until now, only a limited selection has been available in Canada. Founded in Paris in 1862, Ladurée is best known for its double-decker macarons, selling over 15,000 of them daily. Many Ladurée locations also sell ice cream, sorbets, jams, chocolate and candy, as well as branded accessories. Ladurée was purchased by French business group Groupe Holder in 1993, expanding Ladurée from a handful of locations to dozens of boutiques in 27 countries, including several in the United States. You can follow Ladurée Canada's social media for updates, which include the following: Facebook: www.facebook.com/ladureecanada, and Instagram: @ladureecanada.